I was able to attend the AWS re:Invent conference and was extremely blown away by the avalanche of technology they are providing. One of the things that I did while there was sit for the AWS Solutions Architect exam. Generally speaking, I’m not a certification guy. In software development there are few certificates that actually seem impressive. I’m much more interested in your github repository. For Networking Cisco has worthwhile certs like CCIE, and I do respect the Security CISSP Certification. But cloud? I’ve never been a fan. But lately it’s been something on my mind. Today I’m the Principal Architect for a group at Cisco CX and we’re moving a lot of our footprint to AWS. I lead a team of Architects and supervise the work of a larger distributed Architecture team. I also formed an SRE team and am championing transitioning all our development teams to DevOps. Cloudy DevOps. It’s become clear that having a way to measure cloud skills would be useful. So I figured what the heck? Why not see if the test is worth it first-hand? That has the added value of me not asking my team to do something I’m not willing to do. And it’s also a good way to measure myself against the industry. How much do I know? 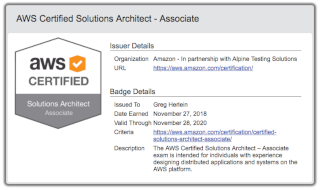 The AWS Certified Solutions Architect - Associate exam is is intended for individuals who perform a solutions architect role. This exam validates an examinee’s ability to effectively demonstrate knowledge of how to architect and deploy secure and robust applications on AWS technologies. Provide implementation guidance based on best practices to the organization throughout the life cycle of the project. That sounds exactly like about 50% of what I ask my architects to do. I’ve worked with AWS for about six years, and attended re:Invent for the first time in 2013. At the time I was at a startup that used AWS heavily ($1.5M/year). I got pretty familiar with EC2, VPC, RDS, ELB, S3, and Redshift. We even dabbled in Kinesis. I converted a “lift and shift” platform to a real cloud-native solution. Although I’ve done some AWS lately, I was rusty and certainly not current since AWS has moved the chains since I was hands-on daily. So I did prepare a bit. Most of my job is teaching cloud-native ideas and I’ve built a LOT of cloud systems so the concepts were not something I needed to review. I was really looking for a review of AWS details. My starting point was to buy a few books. Great book! Definitely was worth the review and filled in a few blanks. I highly recommend this book. Don’t waste your time or money. This book seemed dated and was poorly written, and I don’t think it helps at all. Use the source, Luke. Read this. It sets the stage. You really need to have had practical experiece if you want to do well on this test. I know there are folks who can just study for the test and pass it. But many of the questions are difficult to really understand what they are REALLY asking. If you have at least the recommended year of experience you will understand most of it. But you can never be prepared enough. I also played around on my AWS account, did some terraform, reviewed my Route53 DNS configurations for my personal networks, and read up on blogs (AWS and otherwise). Spinning up and down a few servers both from the command line and from the console just brought a lot back. Writing a terraform script that properly set up a VPC was a good idea, since it forced me to review those details too. I took the free practice test that AWS offers and got a 90%. I took the paid practice test and passed. I know some folks that swear by the Udemy Practice Tests but I did not use those. I would have, had I known about them then. So, I signed up and took the test. I had about a week’s prep. Maybe 8 hours of total review. I passed with an 87.5% grade. Normally I’d be aiming for an ace, but in this case I was evaluating the process as much as wanting to accomplish a certification. And I wanted to take the test at the conference so studying longer just was not an option. It really was a measure of what was in my head. This certification is worth it. Passing this test definitely demonstrates that you have a certain level of understanding, with an AWS-centric twist. The questions are basically “what approach would you use to solve this customer ask?” and the answers are AWS specific of course. But you cannot get them right unless you really understand the WHY that underlies it. WHY does a VPC protect you? HOW does an ALB help you scale? That kind of thing. If you just read the books without having the real experience you may well fail. I definitely plan on preparing and sitting for the Professional Exam. From the looks of the practice test, it’s MUCH harder, as you would expect. For passing the test at re:Invent I even got some cool swag. The coolest was a T-Shirt with binary on it. According the web some of the octets glow in the dark - I’ve not been in a dark enough place to test it yet but luckily the Internet has pictures of everything. It’s an exercise for the reader to figure out what it says. So what are you waiting for? Go get certified already!